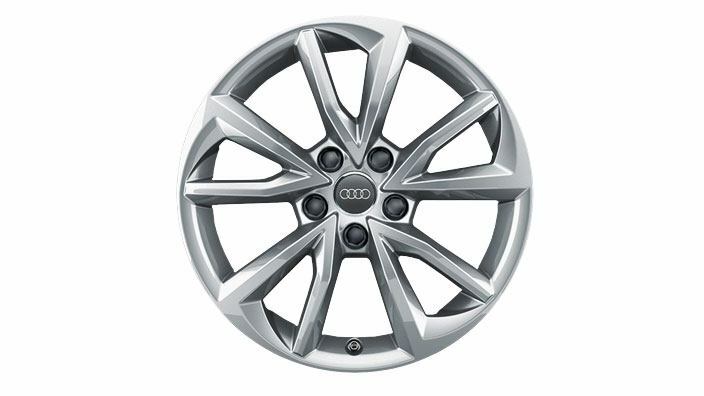 From excellent material and casting quality to four layers of paint and a special hardening process, Audi Genuine Accessory wheels are an investment that will prove to be even more rewarding down the road. 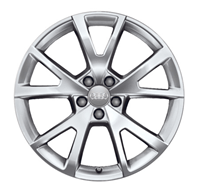 Thanks to their first- class properties, they deliver impressive durability and a long service life. 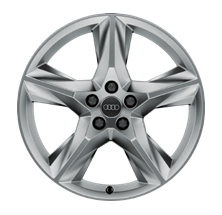 Audi’s broad range of bold, eye-catching wheels gives you the freedom to pick a design precisely in tune with your personal style. 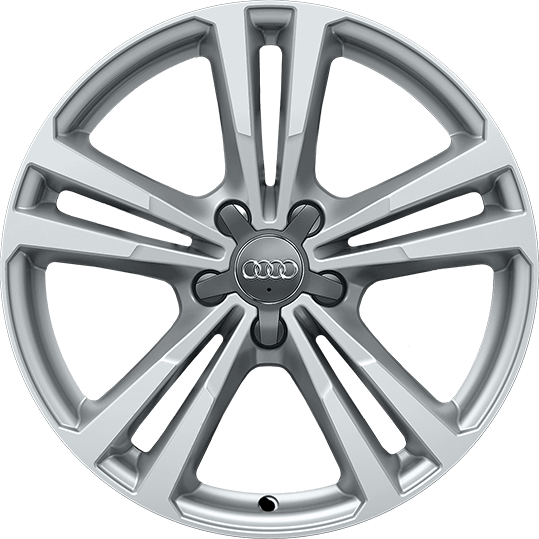 Audi wheels are developed parallel to Audi vehicles, which means they work in total harmony with the models they are built for. 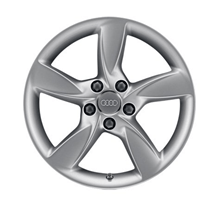 They are designed to achieve the most optimal fit without any tools or adapters, ensuring that the wheels are flush to your vehicle’s bodywork, no matter what their width. 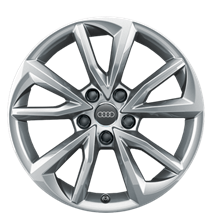 Audi carried out numerous evaluation tests and inspections to ensure that their Genuine Accessory wheels meet the most stringent quality standards. 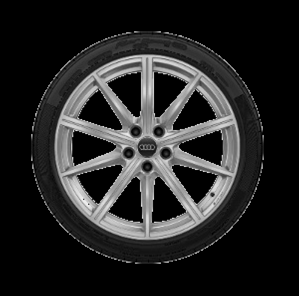 Below is a sample of the many demanding endurance tests and inspections that Audi wheels go through during the development and production phases. An endurance test that simulates the lateral forces experience in a curve. 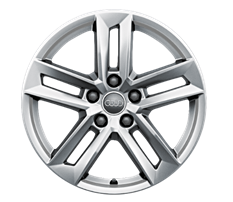 Simulates the forces that act on the wheel when the vehicle is driving in a straight line. 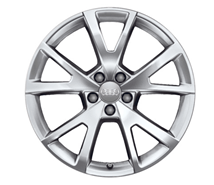 Primarily tests the strength of the wheel’s rim well. Simulates driving over a curb, over potholes, etc. 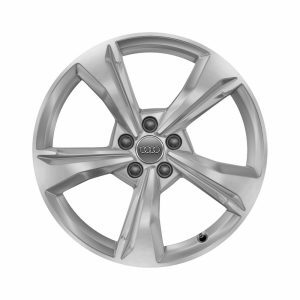 A tensile strength test and a crystallographic image determine the energy absorption characteristics of the rim flange to ensure a high level of casting quality. 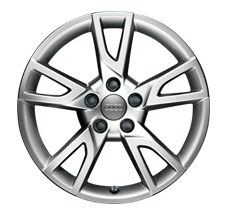 The wheel paintwork is exposed to extreme heat and high humidity. 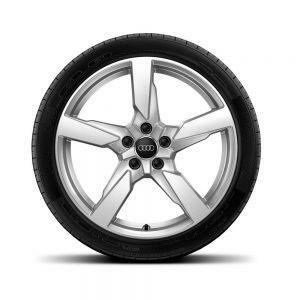 These tests detect any small inclusions or gas bubbles in the wheel. 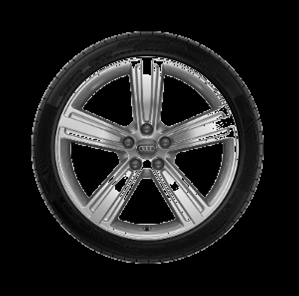 The performance you love with the confidence you need. 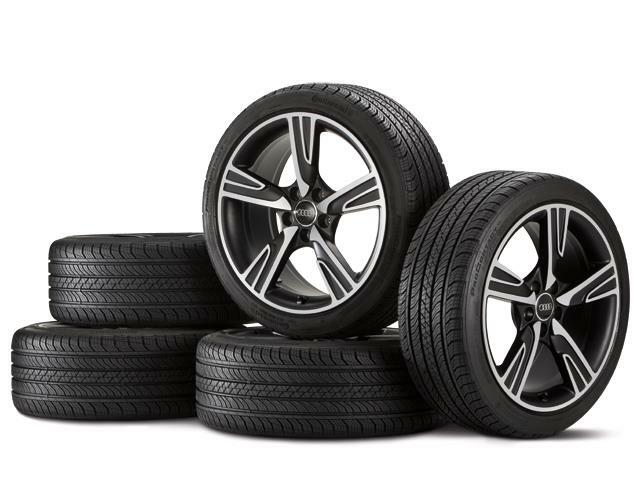 Newer generations of winter tires are designed with a more flexible rubber compound that is less prone to stiffen in colder temperatures. 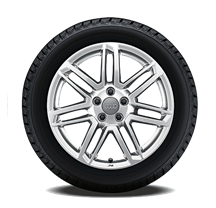 Their tread is also designed to provide improved traction on wet, slushy, snowy, icy and dry cold surfaces. 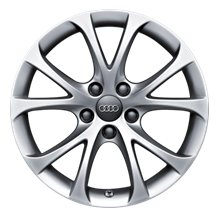 Why choose Audi Genuine Winter wheels? 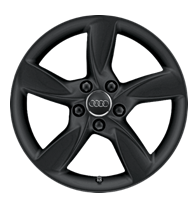 Because of their exemplary durability, rigorous quality testing and striking design. 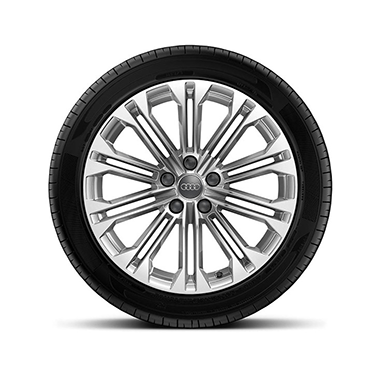 Not to mention – a perfect fit. 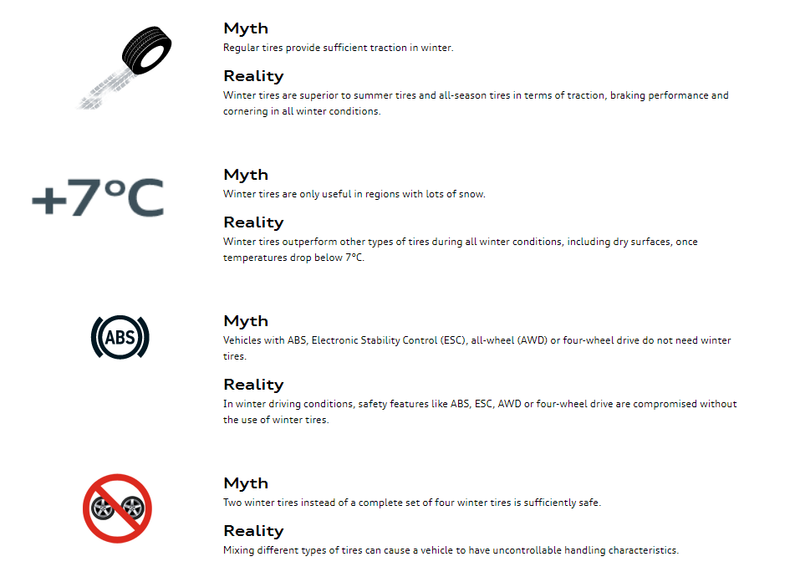 Winter tires also have better traction on a snowy surface at temperatures of -40°C than all-season tires have at +4°C. 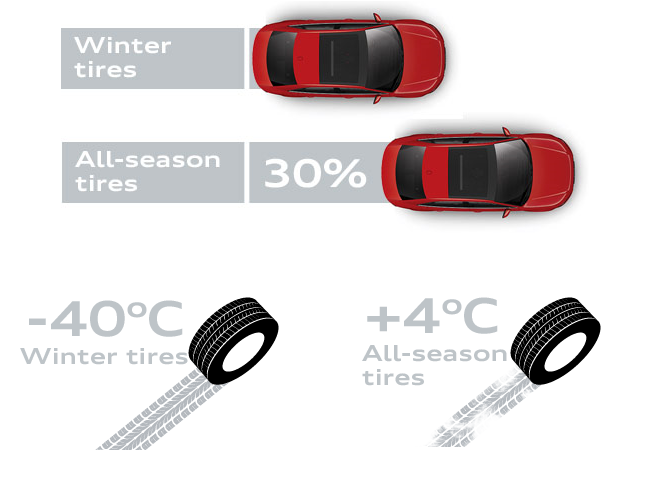 Even on dry pavement, the overall performance of an all-season tire declines as the temperature becomes colder. 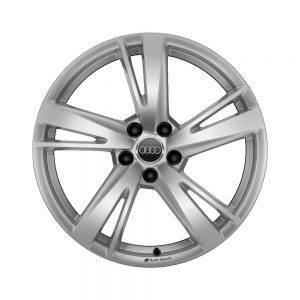 Scroll down to view our available Audi Genuine Winter Wheel packages.